In a chromosomal inversion, one or more segments of a chromosome are reversed. As the chromosome divides, it produces corresponding mistakes in the new “daughter strands.” At this point, KromaTiD’s fluorescently tagged chromatid paints are introduced and highlight the damage to the daughter strands. 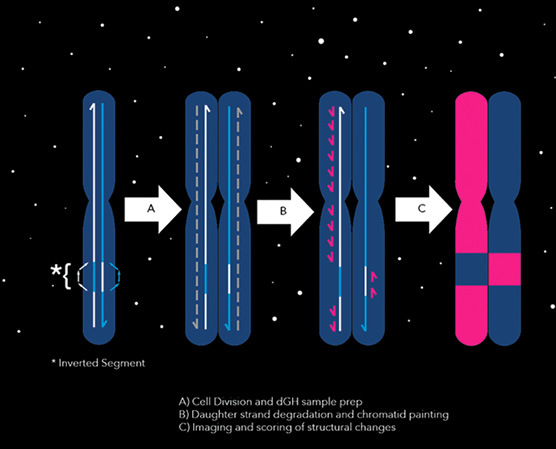 A cutting-edge technique for detecting damage to chromosomes showed enough promise for space medicine that its creators founded a company to market it in 2007. But they had no idea their technology would one day put them at the forefront of a coming revolution in genetics, with major implications for personalized medicine and cancer research, as well as agriculture, industrial safety, and more. That same year, unbeknownst to the founders of KromaTiD Inc., a team in France was demonstrating that a feature of bacterial DNA known as CRISPR, for clustered regularly interspaced short palindromic repeats, serves as an adaptive immune system. In the years since, researchers have found that these snippets of DNA can be used to turn genes on and off and to add DNA coding to a genome: in short, to edit genes. But the potential for gene editing can’t be realized until its side effects, such as unintended genetic damage, can be understood. NASA has an interest in studying DNA damage because astronauts are exposed to high-energy charged particles from the sun and cosmic sources. These ions can rip through DNA, inflicting random harm, which could lead to cancers and other problems. For years, flight doctors at Johnson Space Center took blood samples from every astronaut before and after a long-duration trip into space, examining the white blood cells for genetic damage, says Honglu Wu, of Johnson’s Biomedical Research and Environmental Sciences Division. NASA used the findings in part for biodosimetry—to infer how much radiation they’re exposed to in low-Earth orbit based on the amount of genetic damage they incurred. 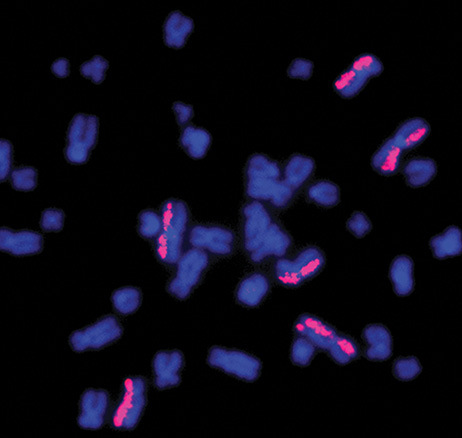 KromaTiD’s fluorescent chromatid paints can visibly highlight areas of damage within chromosomes, seen here as bright pink spots, that don’t match up to the human “reference genome.” They can also be designed as probes to locate specific mutations or irregularities. However, although they could detect the translocation of DNA—when a bit of one chromosome ends up fused to another chromosome—other, subtler forms of damage were harder to see. KromaTiD’s technique promised the ability to directly observe inversions within a chromosome, where a stretch of DNA gets flipped and reattaches backwards. “Translocations can be stable or unstable, meaning the cell may not survive,” Wu says. “An inversion is considered stable. This is more relevant to cancer risk because the cell survives.” What’s more, it repeats the error when it divides, perpetuating it down the cell line. In 2008, Johnson awarded two Small Business Innovation Research (SBIR) contracts to Fort Collins, Colorado-based KromaTiD. It was the company’s first funding, says Chris Tompkins, KromaTiD’s president and general manager, and it went toward proof of concept and refining the technique. The company calls its technology directional Genomic Hybridization (dGH)—directional, as in, “our ability is to see what direction a specific strand or region of DNA is running,” Tompkins says. This is how it detects inversions and other structural variations. Fluorescently tagged bits of synthetic DNA called chromatid paints are applied to prepared chromosomes, which have been arrested in the process of dividing and replicating, on microscope slides. Designed against the normal human “reference genome,” the synthetic DNA couples with the divided parent strands everywhere they match the standard genome, so that any out-of-place signal is identified as a deviation. Or the probes might be designed to couple with and illuminate specific dangerous structural abnormalities in the DNA strands. In this way, inversions, translocations, and other variations that indicate genomic damage can be discovered, detected, and quantified. “With dGH, we’re directly observing structural changes to the genome, along with information about the cellular context of those changes,” says David Sebesta, chief commercial officer at KromaTiD. He notes that this is different from techniques like gene sequencing, which pools the DNA from multiple cells and can indicate a probability of instances of damage but not directly observe them. “For diagnostic purposes, you need to know it’s there and what it is,” he says. Tompkins notes that many inversions are harmless. KromaTiD’s DNA probes can be used to detect disease-driving inversions, such as a gene that should be suppressed but ends up next to a promoter, which prompts gene transcription. The existing and potential applications for dGH chromatid paints are many. In oncology, Sebesta says, examining patients’ chromosomes before and after radiation therapy could allow the dosage to be tailored to the individual patient’s sensitivity to radiation. “We don’t all have an equal ability to repair damage,” he says, noting that some patients develop secondary cancers as a result of radiation therapy. The technology can also help doctors select treatments by identifying cancer-causing mutations. For example, says Tompkins, a patient with lung cancer can be tested for a particular inversion associated with the disease, letting doctors know whether the patient would respond to treatment for that specific genetic abnormality. NASA used KromaTiD’s technology to compare DNA from astronaut Scott Kelly, left, and his identical twin Mark before and after Scott Kelly’s record-breaking stay in space. As expected, the astronaut’s DNA showed some damage after his return, while his twin’s was unchanged. The damage, however, was minimal. The ability to identify genetic drivers of disease can help researchers identify patients for clinical trials. “If your treatment is only for people with a certain mutation, you populate your trials with people who are likely to respond to it,” Sebesta says. Patients with undiagnosed conditions also stand to benefit. Sebesta notes that after thousands of dollars of testing had failed to diagnose a parent and child exhibiting similar symptoms, a simple KromaTiD dGH assay identified a structural alteration present in both patients’ DNA. The company also courts the Department of Homeland Security as a potential customer. In radiation-related disasters, KromaTiD’s technology aligns with NASA’s original interest in observing chromosomal damage to determine the extent and type of radiation exposure. One of the company’s founders has used the technology in a study that examined the chromosomes of wild boars living around the site of the 2011 Fukushima nuclear disaster to determine remaining levels of radiation. Likewise, employers with radiation in the workplace could use it to determine which employees might have been exposed and who are the most sensitive. 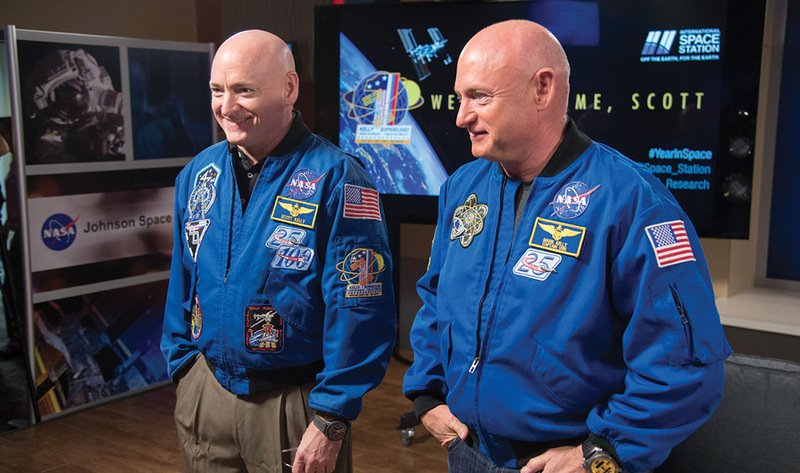 In 2016, NASA contracted KromaTiD’s founder, Susan Bailey, for its Twins Study, which compared chromosomal damage in astronaut Scott Kelly and his identical twin before and after Kelly’s record-breaking, yearlong stay in space. As predicted, Kelly had more DNA damage after his time in space, while his brother’s DNA remained relatively unchanged. The amount of damage inflicted by space radiation, however, was so low it was hardly beyond statistical error, says Kerry George of Johnson’s Human Research Program, who oversaw the study. NASA has since stopped testing astronaut DNA, although Wu predicts that travel to Mars, which would involve higher radiation exposure, will renew interest. The company sees its biggest opportunities in the field of gene editing, where similar damage to that inflicted by radiation has been observed. Sebesta notes that numerous companies have been established and billions of dollars invested in CRISPR-enabled gene editing, which holds enormous possibilities for human health and other industries. But it’s a field that requires refinement, studies into unintended consequences, and the establishment of standards and guidelines before it can begin to tap its potential.